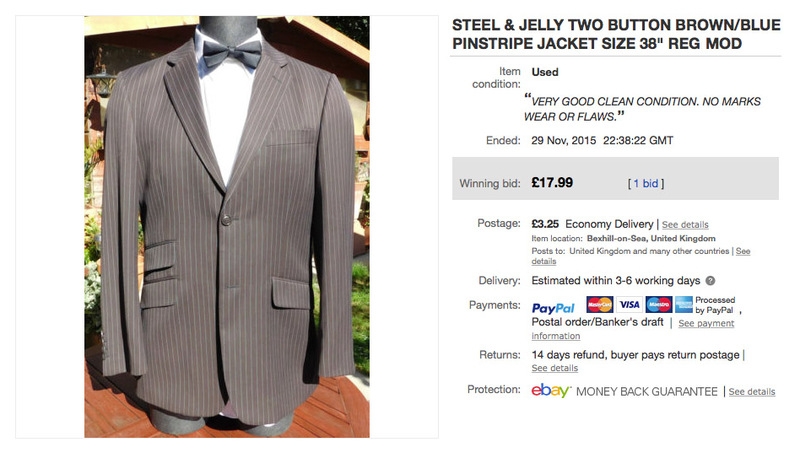 Tennant suit jacket - by Paul Smith??!! 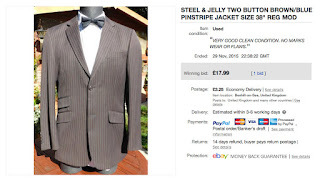 Late last year one of my readers spotted an unusual jacket on eBay. 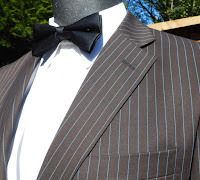 It was a fairly common-place cut suit-style jacket, but made from a fabric which bore more than a striking resemblance to the GAP trousers fabric used to make Tenannt’s suits! Well this week the same reader has stumbled upon a similarly curious jacket - this time made by none other than Paul Smith! Paul Smith has now provided wardrobe for three Doctors: Ten’s dinner jacket; Eleven’s burgundy and blue scroll shirts; and Twelve’s jumper full of holes! I’m informed the jacket has been listed and re-listed several times without finding a buyer, so if you are interested in grabbing it - now’s your chance! 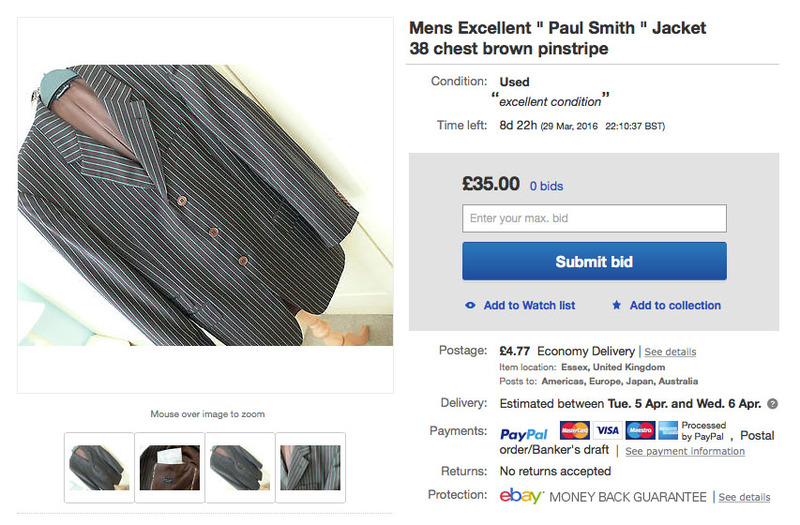 This is a very nice authentic Paul Smith blazer-jacket. It is a classic jacket and is in excellent condition and is in brown pinstripe and 100% new wool. There is a very nice brown lining and a 4 pocket front. It is a 38 inch chest, a 31 inch back length and a 25 inch sleeve length and a shoulder to shoulder measurement of 18.5 inches. There is a 3 button front, 5 button cuff and a double back vent. A reader sent me a link to a recently closed eBay auction. Sadly they missed out on it - but it was clearly hotly fought over! The opening price was a mere US$15.99, but it finally sold for US$515 (GB£360), when the winner bidder sniped it with seconds to spare. 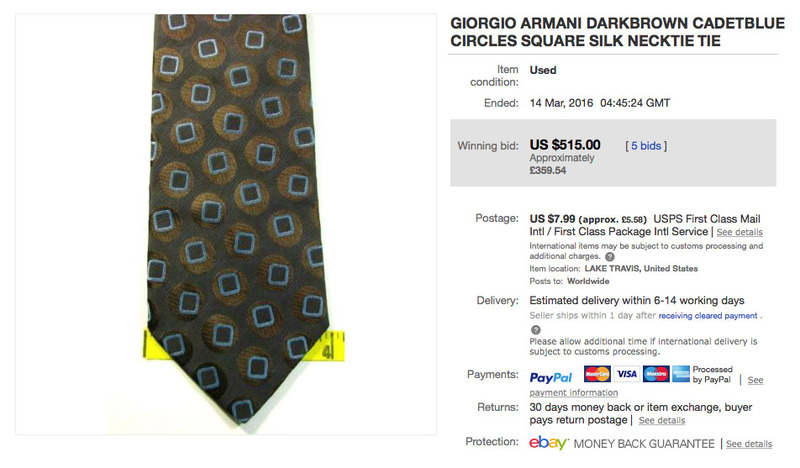 The tie is from an eBay seller who's got dozens of random ties for sale, and there is no mention on the listing of its Doctor Who connection, so I can only guess that the three competing bidders were all eagle-eyed fans who locked in mortal combat to get it! 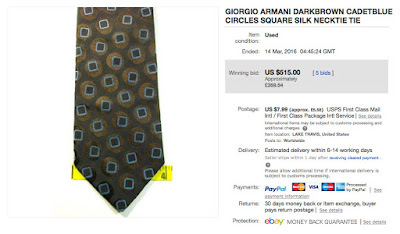 It’s a bit of a heads-up that when you spot something like this online, keep it to yourself if you are serious to buy it, otherwise you might find the price hiked on you by predatory collectors!